This glorious photograph was taken in St Petersburg, Russia, by 31-year-old typewriter collector Alexander Trofimov. 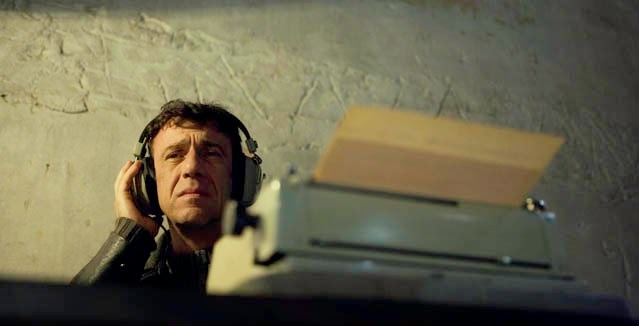 "These technical masterpieces currently enjoy increasing interest in Russia," writes Alexander. 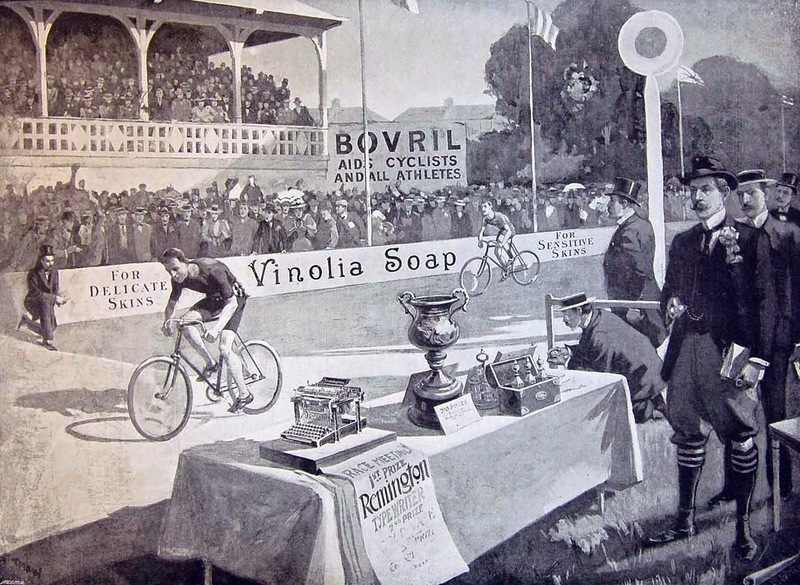 "But a very limited number of fans know anything about the history of this invention. "Along with my growing passion towards collecting typewriters, I have also learned how to fix and restore them, and - surprisingly enough – I discover that St Petersburg lacks professionals who are skilled at bringing such mechanical devices back to life. Typewriter owners from Russia who contact me about fixing their Underwoods or Royals also regret that there are no relevant workshops, not speaking about experts. 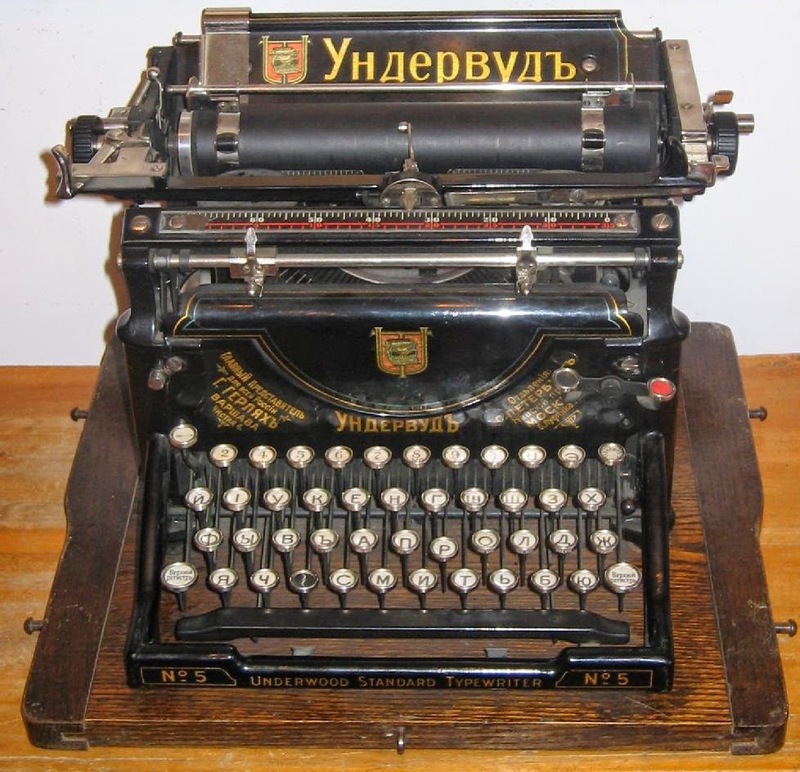 "As I am myself interested in typewriter history and their heyday years, I see that there is a real need to share this knowledge with my Russian co-fans and collectors." I'm not sure which country Fabio Silva is in - he didn't tell me - but I'm guessing it is Italy. "Normally I'm more of a traditionalist, and like to keep things looking original. However, I couldn't resist. 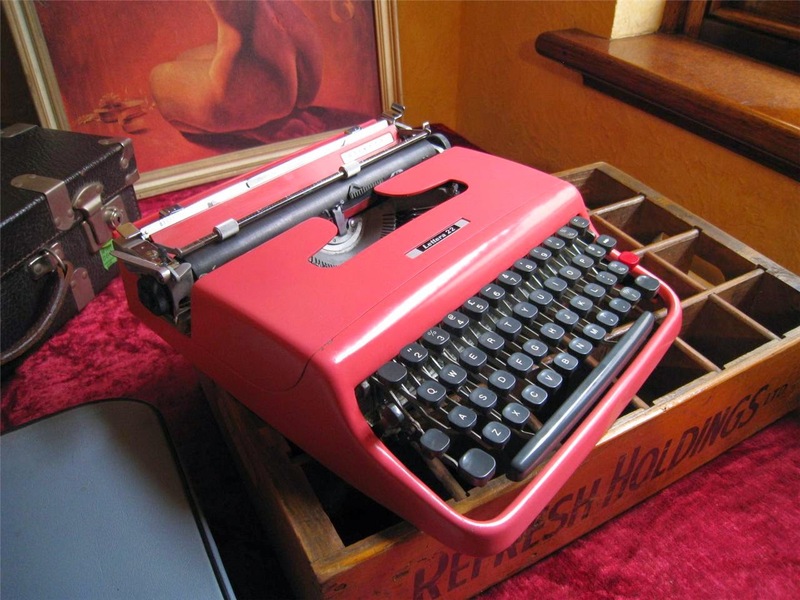 The Lettera 35 has such great styling - but Olivetti really failed when it came to colour choices." 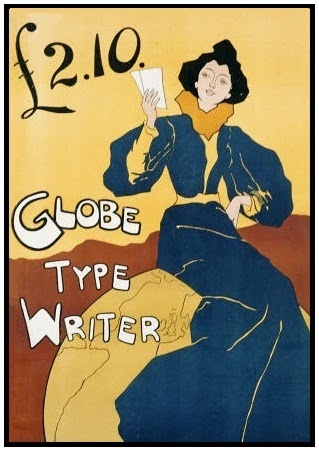 Talk of poor colour choices, Fabio's work reminds me of the fantastic job Piotr Trumpiel did on his previously dull Olivetti Dora - I am tempted now to follow his lead, as he did mine. Steve Kuterescz looks to be headed down a similar track. Can anyone help Michelle, a "regular Polish girl"? 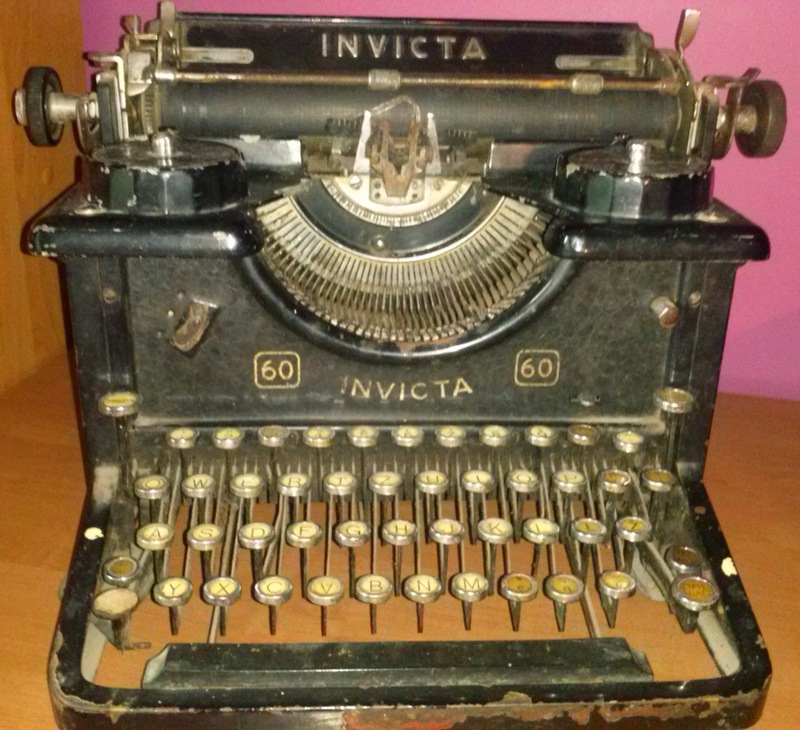 "I found a very old typewriter in my basement and I am curious what is it and if I can repair it. 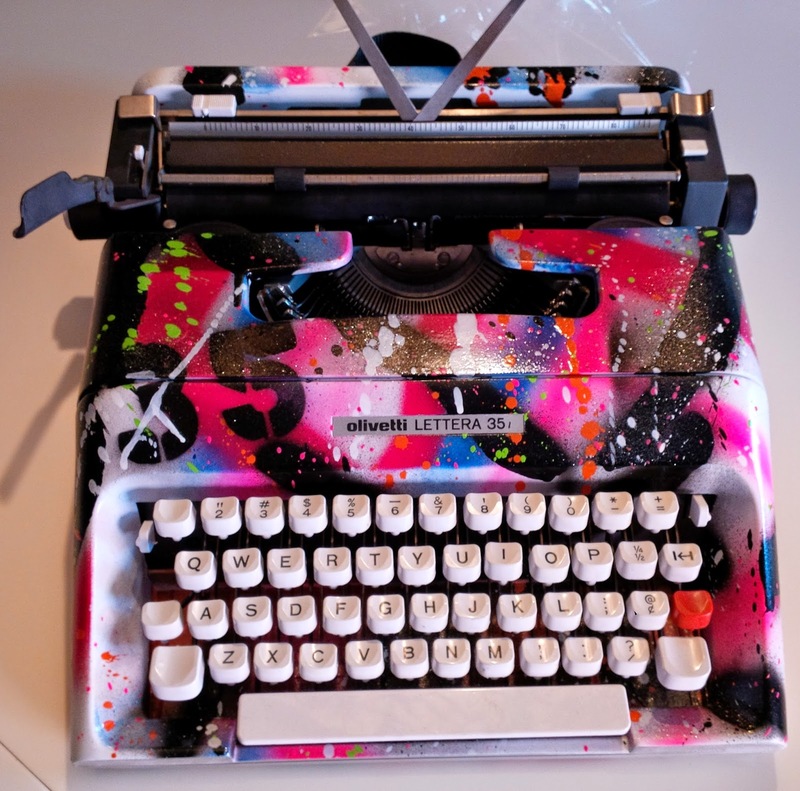 I only know all keys do not come back when I hit them and this typewriter has no tape." 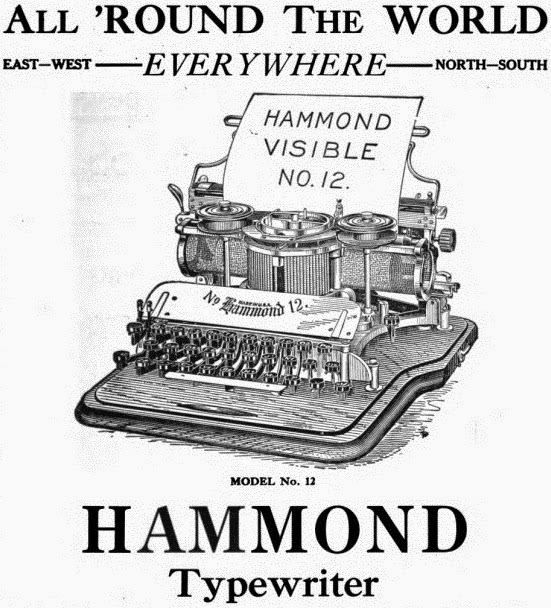 Oops ... one young man wrote: "I just got my first ever typewriter. It's a Remington Envoy. Unfortunately when I received it, it was in bad condition due to bad packaging. This was especially so with the carriage, which was not in place. I managed to slide it back in but in the process some of the bearing balls came off. I am now trying to remove the carriage again to put back the bearing balls but I cannot find a way. I've been trying all day. No info online. Could you please advise?" Been there, done that. In hindsight, the only advice I can offer is the same I gave a chap who wanted to take the platen out of his Empire Aristocrat. One word: Don't! I remember when I posted on Shelagh Delaney's Empire Aristocrat a few years ago that Florian in Switzerland asked why some writers used their portables with the ribbon spools cover off, or in Delaney's case the gull wings up. The writer above went to another extreme. He took the entire mask off his Hermes Baby. 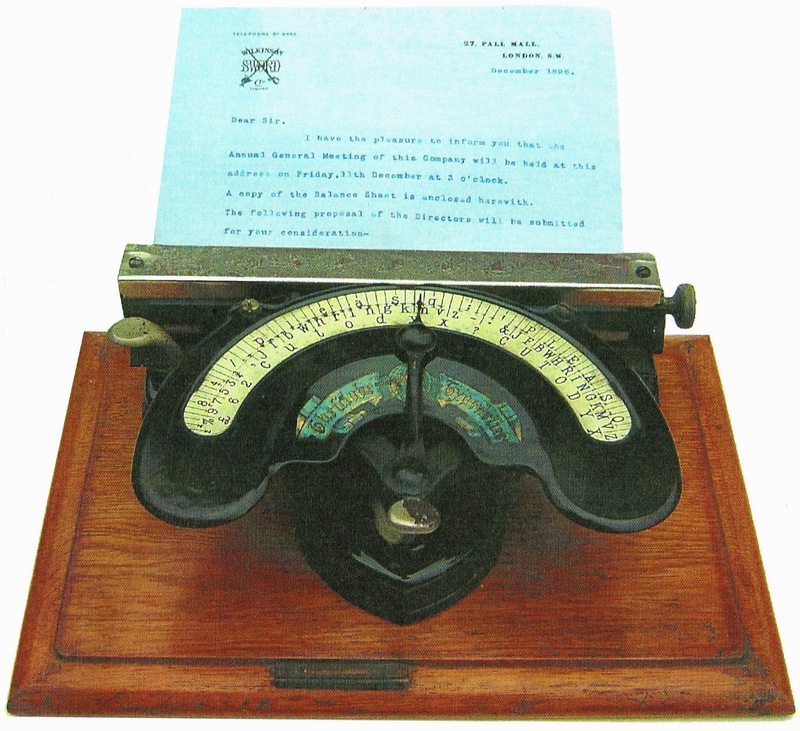 The Stratford Historical Museum in Victoria wrote asking me to identify the naked machine. The writer was Fred Baxter, who wrote All That Money (1967) and Snake for Supper (1968), both children's books. He came to Australia from England in 1952. 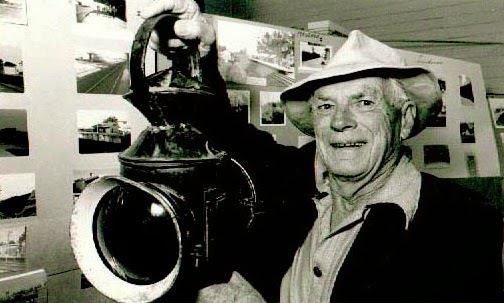 His wife Alice wrote local stories from Stratford for the Gippsland Times, also using the Baby. Fred died in 1993. 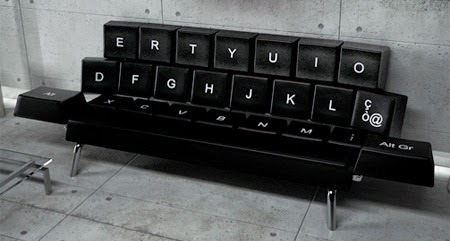 Stephanie van Twuiver sent in this image: The "QWERTY sofa". Keep an eye out for this Hebrew language Continental coming on to eBay - not from me. I'd probably keep it. The new owner wanted to find the serial number before he listed it online. It's good to be kept abreast of sales and prices in the US through Mark Adams. Here in Australia things continue to be topsy-turvy. Some dirty dog tore the keytops off this Royal 10. Whoever has listed it for $10 on eBay says, rather optimistically, "the parts still move but in need of restoration. NOTE: NO BUTTONS ON THE KEYS". 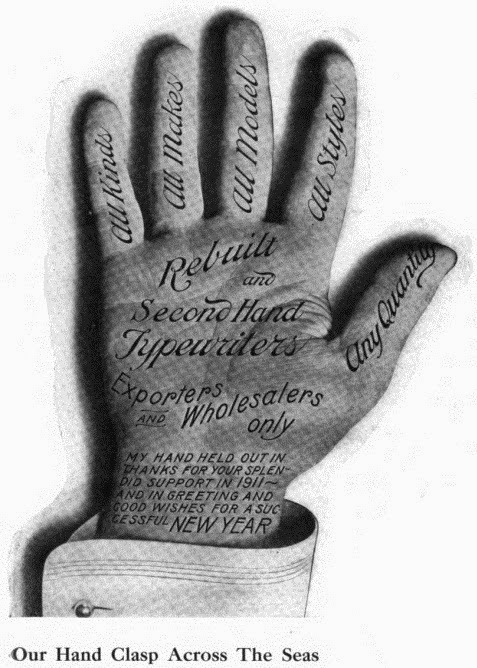 Just as optimistic, I fear, was the fellow who wrote, "Hello mr messenger ... My name is jake and I have a Olivetti 82 typewriter ... Can you please contact me for more info." Remember this? It actually got a bid at $19.95. Now that is optimism realised! 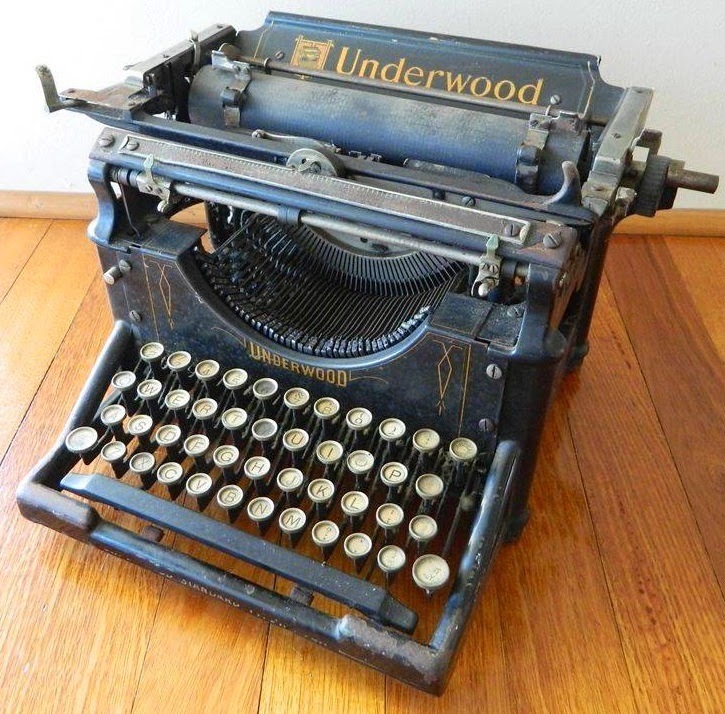 This Underwood, on the other hand, fetched a massive $484 after 27 bids. And this Swissa Piccola sold for $107.50 after just three bids. They're surprisingly not that rare in this country. This Corona 4 went for $132 after nine bids. And this Princess 300 reached as high as $153.50 after 18 bids. I hope I can get the same for my Princesses. 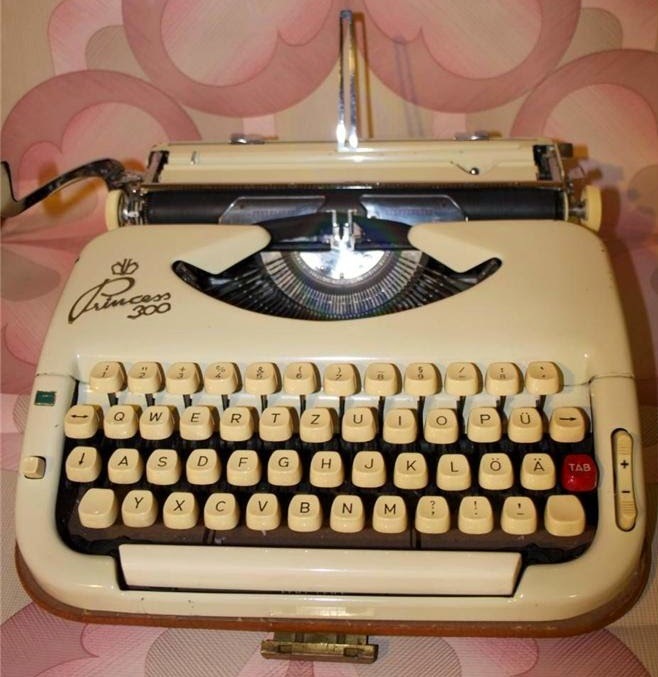 The prize goes to this salmon Olivetti Lettera 22, which sold for an incredible $330 after 28 bids. Ditto what I said about the Princess. And, yes Georg, go Switzerland! 2-1 over Ecuador. US plays Ghana tonight. 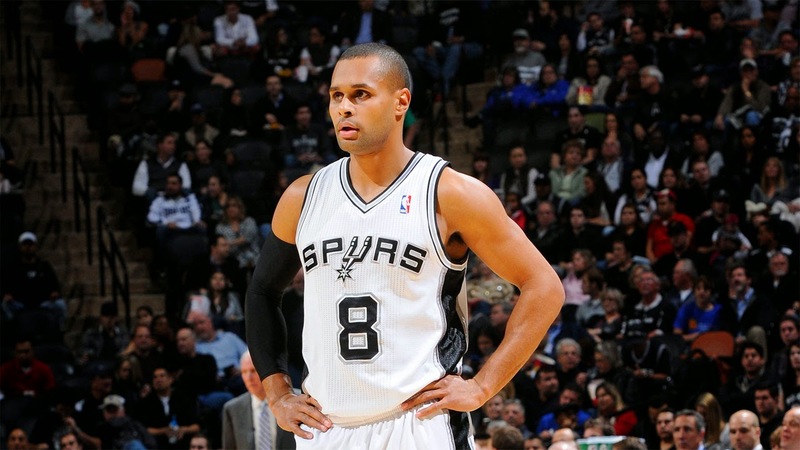 Canberran Patty Mills (yes, that's Canberra, Australian Capital Territory) has got San Antonio home from beyond the three-point line against the Miami Heat in the NBA decider. Australia's Red Bull Formula One rookie Daniel Ricciardo won his first Grand Prix, in Canada. The All Blacks have so far won two from two in rugby union Tests against England. Close, but wins are wins. That's 16 Tests wins in a row now. New South Wales look like winning their first State of Origin rugby league series since 2005 when they meet Queensland in Sydney on Wednesday. Series 3 of everyone's favourite show, Call the Midwife, ended last week. But the good news is the BBC has commissioned a fourth series. Parer's War used a Royal instead of a Remington portable, but it was still an excellent show. Surprisingly high prices. You better move to Switzerland, where most of these machines are to be found for 10 €. Fascinating Hebrew machine. Odd about the carriage return lever, isnt't it. I would love to get hold of that Hebrew continental. As someone who uses ancient Hebrew a lot I'd love to have one in my collection. I'm imagining the carriage probably moves from right to left but rather than moving the carriage return lever to the right they reversed its orientation. 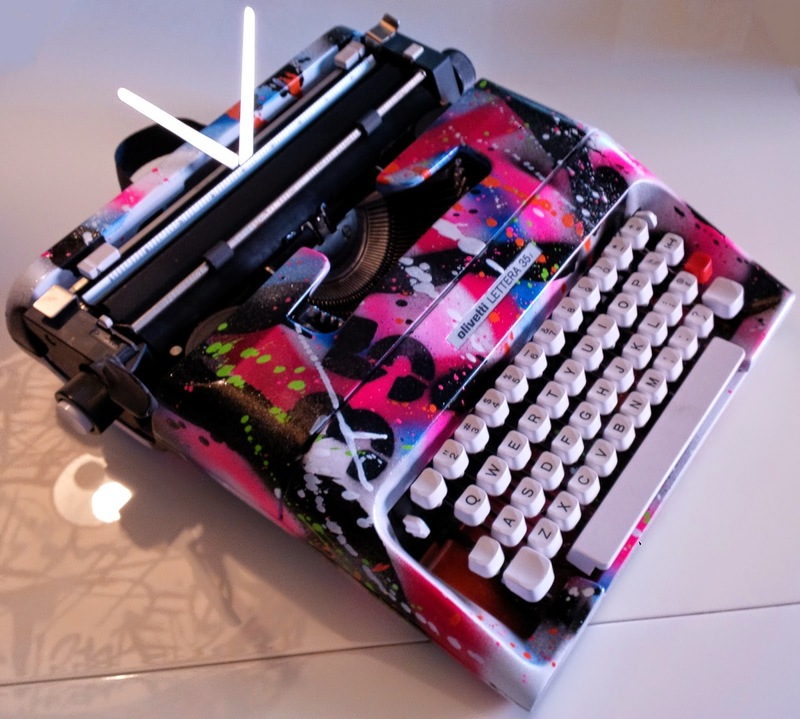 On prices, I'm tired of some of the ridiculous offerings on Trade Me and the obscene money people are asking for typewriters in NZ. Shipping from Europe is a pain both in expense and frequent damage incurred. 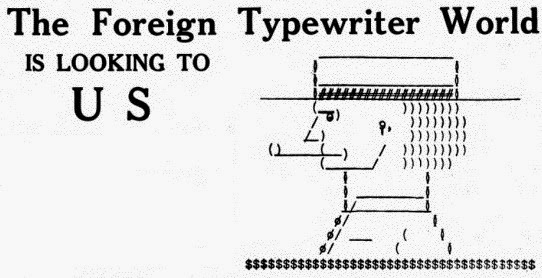 sic "right to left" meant "advances left to right with key stroke"
Thanks for sharing more tidbits of the typewriter's enduring and resurging global appeal, be it fascinating or annoying. As for prices... I hate when sellers say "everything works fine" and/or "excellent condition" and then a few lines down, in the middle of another paragraph, "missing letter" and/or "nothing moves". And they hardly ever mention rust and pics comonly try to hide such damage.